A good drop shadow is hard to come by. There is no shortage of Photoshopped “shadows” on the web that are nothing more than a grayscale circle with a little Gaussian blur. In their simplest form, shadows are obstructions of light produced by the object casting them and the light surrounding it – but their shape, color, and intensity is dependent upon a whole goody bag of variables. The distance between the object and the start of shadow and the direction and intensity of the light all impact how a shadow appears. Which means people wanting to replicate their dynamism in Photoshop have their work cut out for them. Aaron demonstrated his process for producing realistic-shadows from scratch during his Retouching Product Photography class. 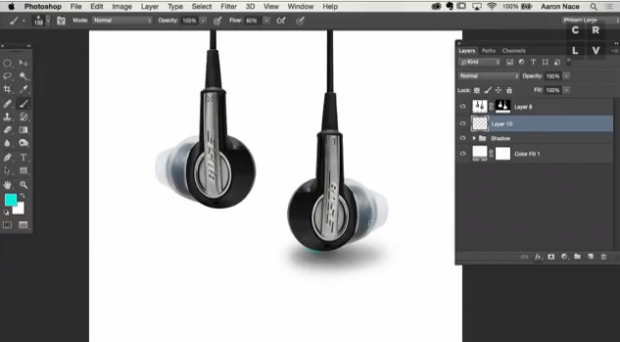 Using a photo of ear buds against a white backdrop, Aaron taught how to mimic shape and convey distance using some very simple techniques. The post Photoshop Tip: Use Layers to Create Super Realistic Shadows appeared first on CreativeLive Blog.